Conceived as a vigorous jungly shrubland to screen off a large town garden distinctly overlooked, the design includes architectural floras with evergreen sculptural attributes from New Zealand, East Asia and Mediterranean climate regions. 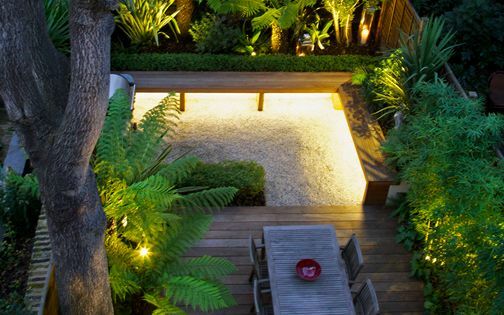 This low-maintenance, year-round lush canopy thrives in the garden's courtyard setting, where high walls and Cedar panels form a sheltered microclimate, enjoyed further from the vantage point of an upper roof terrace. 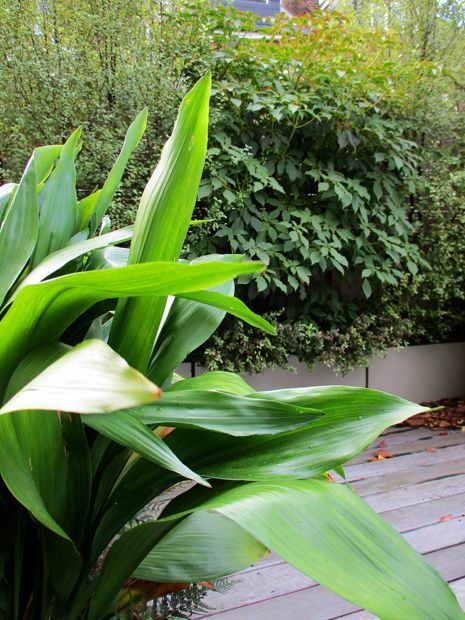 Cultivated in ground borders, raised beds, as well as custom-made troughs, the plants' diversity of outlines, heights and foliages provides not only precious privacy, but also a leafy luxuriance abundant in light reflectance, contrast and texture in the north-facing aspect of a Brondesbury back garden. 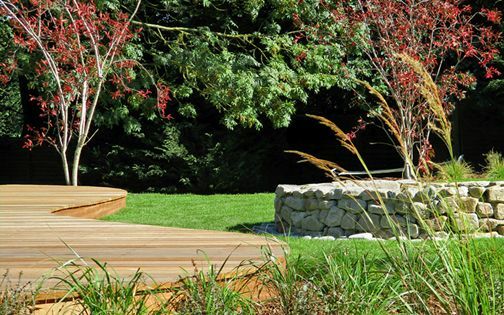 A 6-metre-long cantilevered bench spans nearly the entire garden's width, floating rectilinearly among an l-shaped raised bed along the back elevation. Clad in Balau hardwood and tranquilly lit beneath, the elongated bench diversifies seating potentialities, while ably retaining surface integrality to maximise the continuity of tiling. 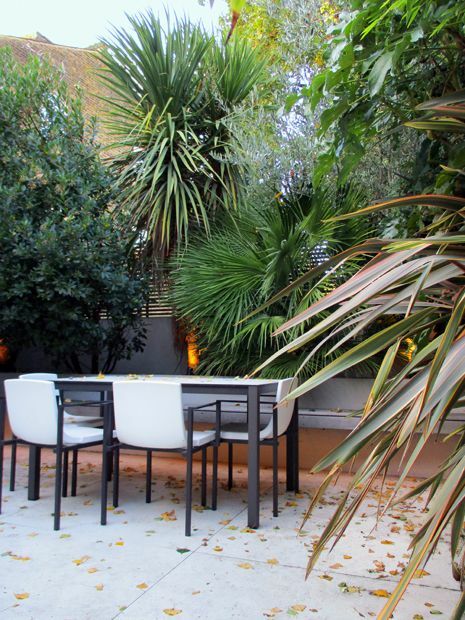 Enveloped by luscious foliage, and furnishing a clear vista of the roof terrace, this king-sized seat extends linear expansiveness in a courtyard outline tapering acutely at eighty degrees towards its top-left corner. Decidedly focused towards much-needed privacy along its extensive boundaries, the courtyard's design layout correspondingly embraces the home's minimalist blueprint, where monumental tiles, 1.2-metre-squared, maintain the interior's floor pattern in an expansive grid of milky clarity. Transitioned into an upper seating area via an angular step two thirds in, this large-scale patio fosters in its aptly spacious layout the momentousness of forward planning in articulating modern indoor-outdoor fluidity. Here in Brondesbury, urban living's heptad of alfresco necessities manifests our hankering for verdant well-being, uninterrupted views, uncomplicated framework, ease of maintenance, prized seclusion, effortless socialising and night-time illumination. 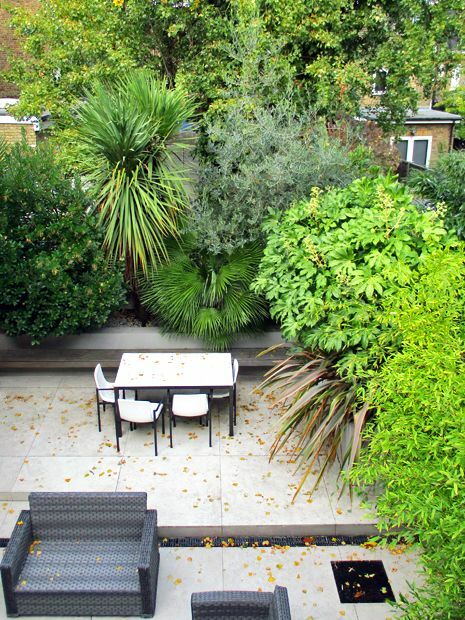 Cardinally seclusive and exclusively evergreen, this courtyard back garden imparts profuse verdancy, brightening a Brondesbury home's rear elevation facing north. 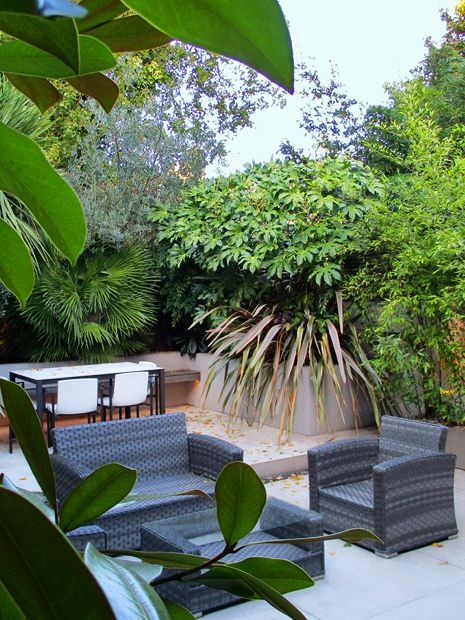 This intimate lush inner sanctum softens the spatial asperity of a hard-edged trapezium-shaped urban outdoor space, sustaining non-stop carefree refuge with bold, diverse foliage, while harvesting subdued dayglow to maximise surface reflectibility dependably. Multidimensionally composed, harmoniously juxtaposed and generously soothing, the selective yet highly architectural plant palette produces a lush courtyard garden invigorated by a sculptural planting design with Timber and Black bamboo, Palm trees, Arbutus, Fatsia, Hoheria, Olive, Loquat, Magnolia, Nandina and Phromium. 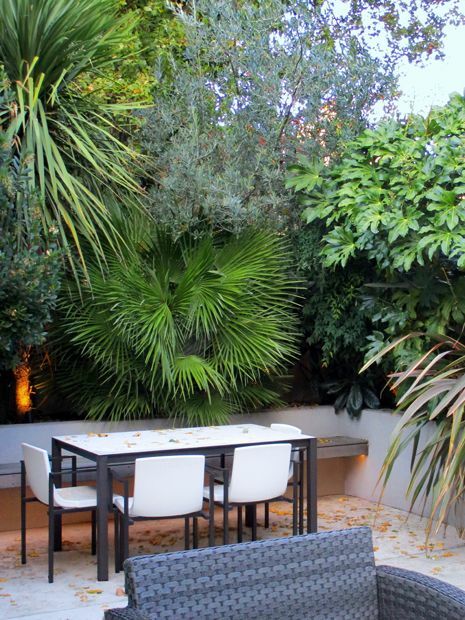 A 30-square-metre roof terrace hovers above the courtyard garden, interlinked by reiterative planting of Cordyline palm trees, cohesively triangulating the rooftop's edges with the garden's central focal point further below. 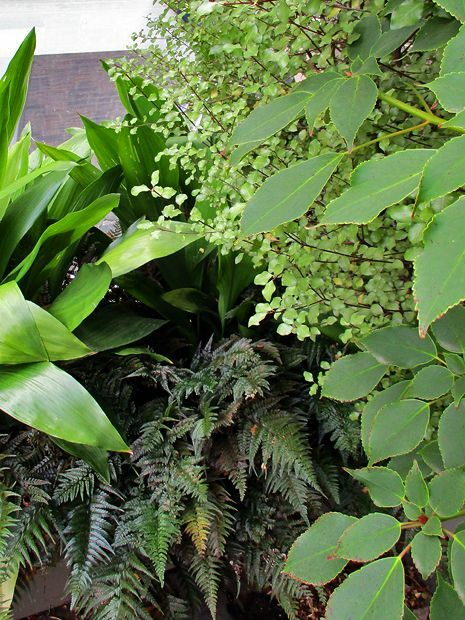 The gamut of New Zealand species continues fittingly, with Pittosporum cultivars varying in height and leaf colour, alongside glossy lush Aspidistra and serrate Rock ferns. The pivotal privateness factor carries its resolve to the rooftop, where Cedar screens and tall hedges enshroud the decked terrace at the far ends, encompassing a spacious viewing platform to appreciate the garden panoramically. 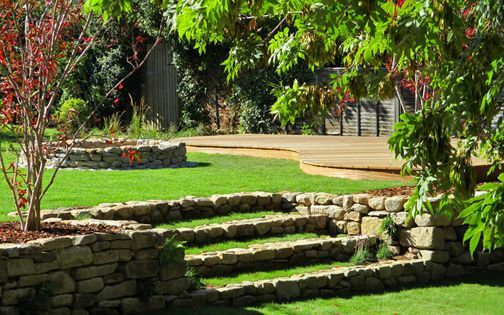 For our not so green-fingered clients, the garden provides a perfect environment – always green and requiring sparse upkeep. 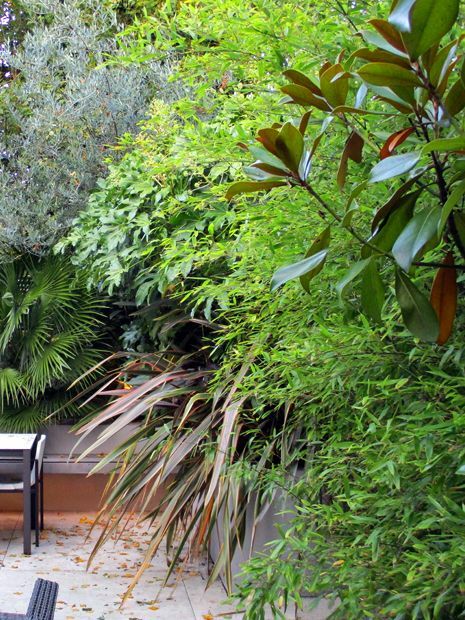 The self-sufficient planting forms an architecturally dynamic lush courtyard, amply watered via an automatic irrigation system and rarely needing pruning. 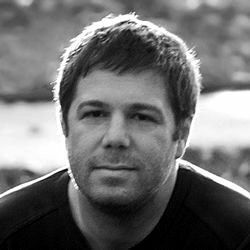 Selecting appropriate species for the microclimate, in the optimal initial size, and spacing them correctly, facilitates a robust and long-term scheme. The resilient tiles are handily cleanable, and with minimal wood details, there's scarcely any varnishing required – leaving plenty of leisure time to switch on the lighting and gaze at the autumnal heart-shaped confetti descending into the courtyard, showered by a giant Lombardy poplar in the garden beyond. With a split-level framework, the courtyard's seating areas appear multilayered and purposeful, zoned distinctly accordant with function. 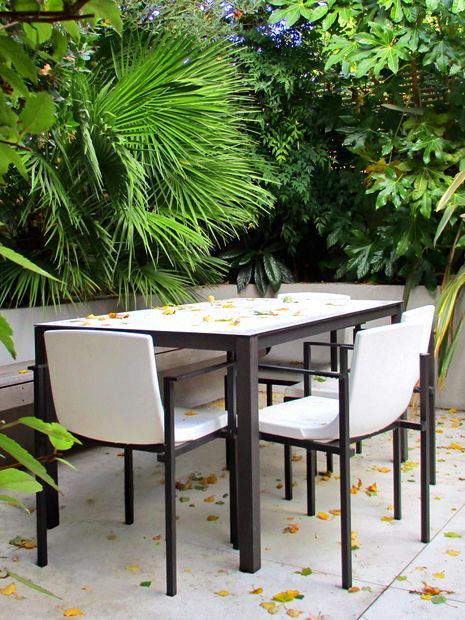 Elevating the garden's valued spaciousness, furniture corresponds in both scale and texture to the surrounding volume of plants, forming an integral part of the architectural fabric. 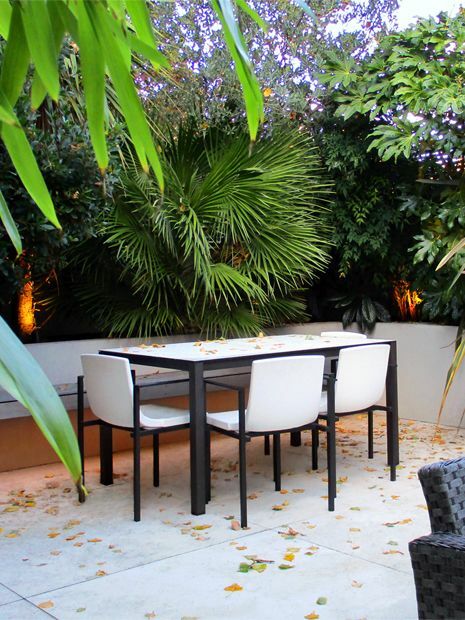 While a sizeable lounge set benefits the larger part of the courtyard, closer to the kitchen, a smaller dining table merges with the cantilevered bench to vary the atmosphere, beneath the lushness and intimacy of leafy canopies. The much-valued comfort of a large courtyard garden manifests its spatial ease not only in the peacefulness of picture-perfect vignettes viewed through glazed apertures, but also in the sheer convenience and variance of utilisable amenities. 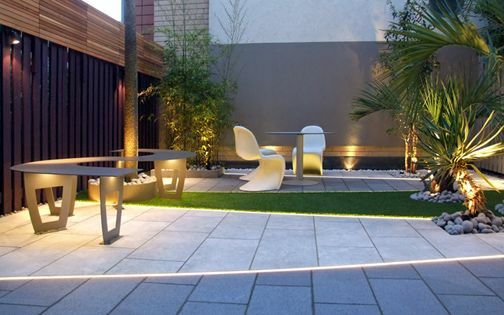 Socialising, cooking and dining zones, essential privacy, architectural integrality, harmonious colours, indoor-outdoor flow, functional maintainability, and the serviceability of irrigation, drainage, lighting, heating and sound, all aggregate to a highly pleasurable outdoor experience. But most of all, the solace of such a peaceful place is often gained in the well-being derived from the lusciousness, multilayeredness and vigour of alluring plant life. To enable plant cultivation in a fully tiled courtyard, add variation in materials, colours and shapes, as well as increase height for privacy, the plants along the first part of the garden are featured in bespoke planters. These custom-made troughs continue into the roof terrace and front garden, maintaining a compelling architectural presence, juxtaposed alongside rendered raised beds and ground borders. This visual continuity enhances largeness of scale and sustains greenness, while facilitating coveted seclusion. 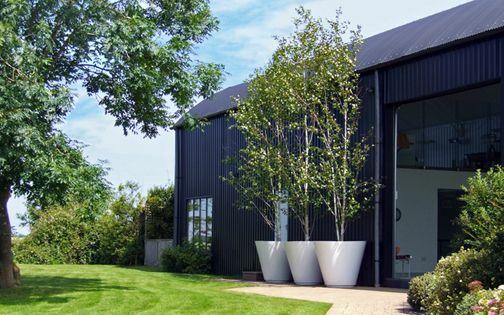 With three long tubs containing Bamboo at either side of the courtyard, and a symmetrical duo of custom tapered tree planters featuring Southern magnolia trees by the kitchen doors, the space gains elevated, varied forms of focal plant displays and unmistakable zonality which maximises usage. 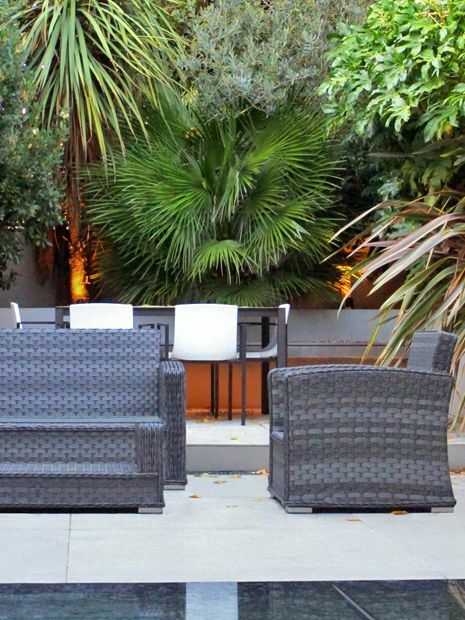 Sizeable plant species, thrivingly gaining stature in a large courtyard garden setting, require ample, durable outdoor lighting, and here, the spotlights permeate lush Palm tree canopies and broad-leaved shrubs with wide angle beams and ample wattage. Linked to the roof terrace, the courtyard's lighting system creates an expansive perimeter which amplifies the house elevation voluminously with dramatic silhouettes. The bench's vast elongation complements this radiant ambience with a rectilinear afterglow produced by a concealed LED strip below, while light fittings are discreetly concealed by luxuriant cascading foliage. 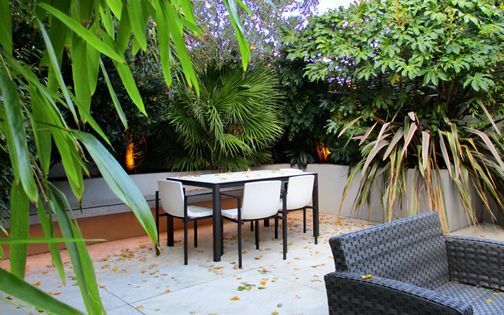 Secludedly intimate, this lush courtyard garden embraces viridity rather receptively – a horticultural self-assurance thoroughly evident when we visited our clients recently, three years after completing the project. Perhaps karmically nurtured by its peaceful owners, or merely nourished by the afternoon sun and an abundance of nutrients, water and drainage, it seems the courtyard was advantageously predestined for picturesqueness. 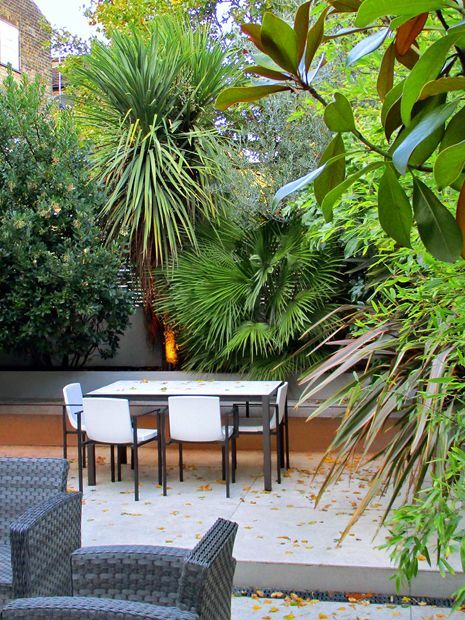 But, this place was undoubtedly far from utopian seclusion following an extensive home renovation, when even after a substantial extension, the remaining large courtyard garden endured much exposure to neighbouring properties. 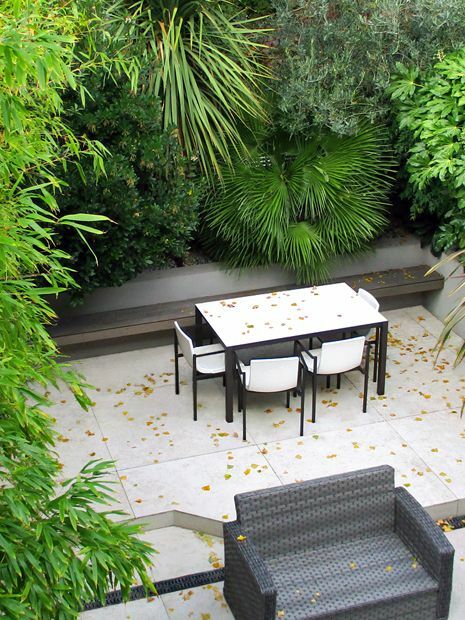 The combination of high walls, Cedar screens and tall vegetation had transformed an ordinary Brondesbury back garden into a flourishing, secluded hideaway. From a barren expanse of colossal stone tiles, utterly exposed and functionally unusable, this large courtyard garden was picturesquely transformed into an autonomous array of invigorative greenery. 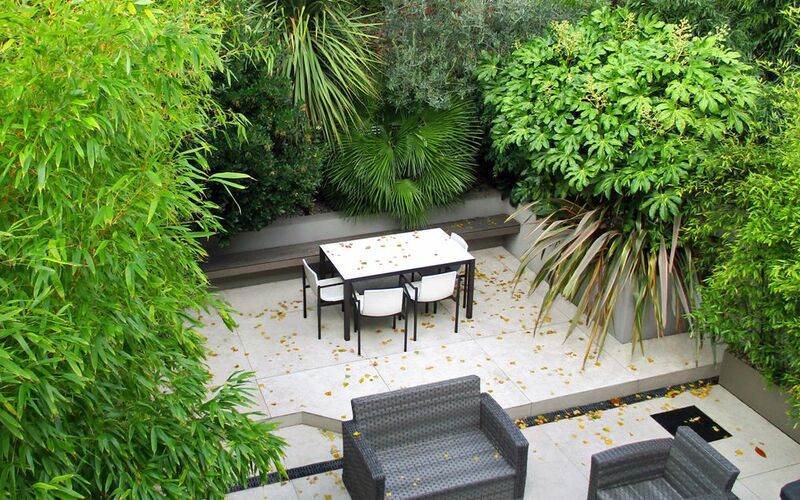 This modern boscage flourishingly endorses our clients' lifestyle, where the grandeur of vegetation, brilliance of surfaces, sumptuousness of facilities and potency of lighting accomplish architectural splendour as a London garden design luxury – a Brondesbury outdoor haven.